Recently we hosted a webinar with fundraising software provider Greater Giving all about practical tips to describe, display, promote and sell auction packages more effectively. Today we are sharing part I of a lively Q&A session with charity auction organizers around the country. How can we use auction items that didn't sell - or extra items that weren't offered at all? Our silent auction venue is extremely limited on space. What can we do? How many items should we include in the silent auction? Are VIP tickets that open up the silent auction 30 minutes early a good idea? 1. We have a huge space for our silent auction. Other local nonprofits have had 600+ items in the room! Last year, we had only 60 items with 300 attendees. With 400 expected guests this year, should we be looking at 100 items? ~Thomas K.
IAN: That's around the amount you should be looking at: half the number of buying units. I would err on the small side. You want to create competition, so I would say 100 items, max. Plus, your silent auction shouldn't be an advertising junk yard. You want to be strategic about the items you place out there: no $20 gift certificates from your local gym. If there are items that aren't going to get much revenue, it might not be worth putting them out there at all. What do you think, TRACEY? TRACEY: I would agree from a numbers standpoint. Try taking a look at the revenue generated from your silent auction from last year. Look at the packages you had, how much they made, especially those that made less than their fair market value price. Does it make sense to include some additional silent auction packages? Also, if you have all your bid sheets from last year, take a look at the active participants. You'll see how many units are active in your silent auction and plan accordingly. If you have a ton of activity on all your packages, or if you have increased guest count, throw in some additional packages. If 30 to 40% of packages got just 3 or 4 bids, it might not make sense to add additional items. 2. We're limited on space in the silent auction, which is a huge revenue source for us. We rented a tent and put it in front of the entrance of the venue. The tent was very expensive to rent. Do you have any other suggestions? ~Kelly F.
TRACEY: I don't know if you're using paper bid sheets or not - but if you use online bidding, it's an amazing way to eliminate the need for paper bid sheets, and the need for laying out all of those individual items. It's one of the coolest features: You don't need to have a silent auction display at all. 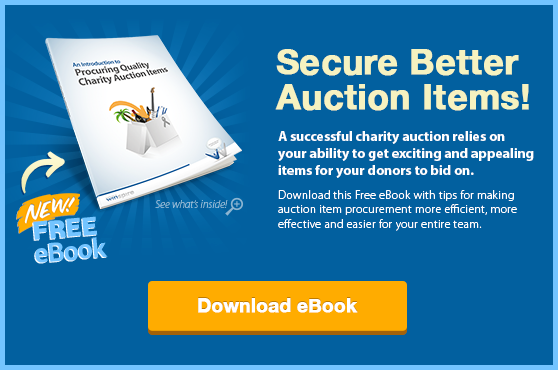 You could completely eliminate it and just utilize online bidding for your silent auction. It's a great way to eliminate the cost of renting a tent and additional space. Perhaps you can reserve displays for your top items. IAN: Very interesting question. I know it can be painful to even think about cutting down the silent auction if it's bringing in money. But how much money did you spend on the tent, and did putting out all those extra items really net more money? You also have to think in terms of volunteer time. How much time did it take your volunteers to go out and procure all of those items. Maybe it does require having a bigger venue. I'd have to see how many attendees you have and how much you raised on all those items. It's important to take a deep dive into the cost vs. benefits. Look at all the items - how much was bid on each one, and if you have the capacity for a huge silent auction, and it's been historically raising a ton of money, then by all means you should follow the money. Just imagine if, instead of volunteers spending 200 hours procuring silent auction items, they spent that same amount of time putting together 10 incredible live auction items that are truly catered to your top tier of spenders. They could spend $10,000 or $20,000 on a single item, and you could sell it twice. I've seen a really good item sell for $30,000, $40,000 because people just have to have it. It sounds like you have a lot of people and a high spending capacity - so think about where you're spending your time strategically and what is your ROI (return on investment) on those things. 3. What are your thoughts about doing a silent auction completely online versus a night-of silent auction? ~Stephanie T.
IAN: There's merits to both, and you can actually do both. That's a great way to use items if you have too many. If you've packaged 'em all and have items for half the number of buying units with items left over, you also have the option of an online auction. I wouldn't remove the night-of silent auction completely in favor of the online, but I would utilize both if you're able to. 4: What is your experience with donors who donate to the silent auction but their items didn't make it? They end up in the "closet of extra items" throughout the year. ~Emily B. Be sure to list a couple things you're going to use it for, then thank them again profusely for their donation. As long as you get out in front of it and explain why it wasn't there, people are going to be totally fine by the time they get to the event. 5. What do you do about items you offered that didn't sell? IAN: If it's a consignment item, you don't have to worry about it - if it doesn't sell, you move on. If a donation doesn't sell, say in the silent auction, I talked about that 'closet' where you have auction items you didn't put out or sell. There's so many ways you can use those items throughout the year. You could have another small fundraiser, a summer event. They're not a huge gala, but there's ways you can still use those. You can have an offseason, online bidding storefront. You can have a raffle. You can use them as incentives for your volunteer team. The sky's the limit in terms of what you can use these donated items for. Everything has value. The question is, how can you use that value to make money? TRACEY: Frequently we've seen people do what's called a 'fire sale.' After their event is over, they package everything that didn't sell and you can do a 'fire sale' completely online using GreaterGiving. TRACEY: That's hard. When you get items, there's no guarantees on the quality. If the box isn't in great shape, find a way to repackage it. See if you can get a new box. After all, you wouldn't buy it off the shelf if it was beat up so you want to make it look nice. You definitely want to present your items in the best light possible. Being sure that they're packaged and looking nice and well put together is important from a sales standpoint. 7. Would you recommend posting on our Facebook event page asking attendees what they would like to see in the live auction? ~Robin M.
TRACEY: Sure! A great time to ask that kind of question to event attendees is right after your event has happened. You want to capture their interests, keep their interest in your event, get them excited about coming next year, and ask that question far in advance so you can start planning and procuring items a year out. IAN: I agree. Get out there, ask some questions, and ask 'What do you want to see?' Be energetic. You can send surveys to your attendees. The more information you have, the better. It really gets people actively participating in the event planning process. IAN: As soon as you're going to start promoting your event, have your Winspire packages reserved in your Suitcase. You can use them to promote your event, sell tickets, and even procure more items. Here's what we mean. When you show you already have items to offer as part of your live auction - maybe you've gotten it underwritten or donated - that begets more cool items. If organizations see you have a really cool travel Experience already offered in your live auction, they're going to want to be a part of it. You can use it when you're going around procuring items in your community. So as soon as you start promoting and procuring, I'd have those Winspire packages reserved. That said, you can reserve them all the way up until the day of your event if all of a sudden something falls through. If we had an auction tonight and were still looking for 2 to 3 more wow-worthy items, we could reserve a Winspire package, download the display materials, put images into a PowerPoint and go, all the way until the auctioneer takes the stage. 9. Just sharing - our event cut the silent auction three years ago, thanks to advice from Winspire. We cut the number in half and raised almost the same amount of money. Another bonus: fewer unsold items! ~Casey P.
IAN: If you can cut that time in half and use that time elsewhere - to plan the event, talk to the board, go get sponsorships... that's huge! Have your volunteers get sponsorships for aspects of the event instead of going out trying to get $20 items from all the different retailers. Thank you for sharing that story. 10. Is selling VIP tickets a good idea if the plan is to let them view the items 30 minutes earlier than general admission as well as have a private cocktail hour? ~ Jeanette C.
IAN: I'm not sure. I've been hearing of the VIP aspect. If people are willing to spend a little bit more money on a VIP ticket, then more power to you. I don't know if it's a revenue generator or not. My only reservation is that people are getting in and starting to drink earlier. You're already battling an alcohol bell curve where people get too tired at a certain time, and if they get too drunk, they won't bid as much in the live auction. So you run that risk if you have them in sooner and start drinking earlier where it might negatively impact your event. TRACEY: I've definitely heard of it as well. It's newer. I can't say I've personally been to or part of an event that's done that. But there are people all over the country trying to find new ways to retool their event and add additional revenue. Go back and at the questions to your event-night guests, high-level donors. What do they want to see? What would make the experience better for them? If it's having a VIP cocktail hour or having early access to be able to bid on items, then absolutely - do it. Another tip: When it comes to making changes to your event, especially if it's an event you've been doing for multiple years, only make one big change at a time. With just one control factor, you are able to get a good look at how that change affected the revenue numbers. If you change 2 or 3 things at the same time, you won't ever be sure which of those changes had an impact on revenue. IAN: I would say, everything's worth a try once. If you try it, be hyper focused on how it affected your event, and the data. Did it actually raise more money, or not? If it didn't, if there was no net impact on the amount of money raised in the silent auction - it might not be worth it.